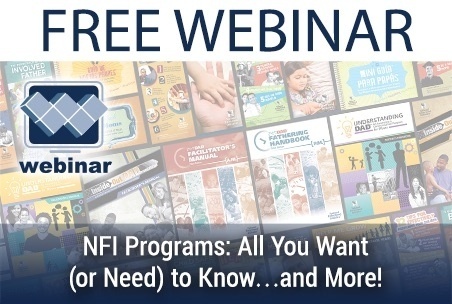 Free Webinar > NFI Programs: All You Want (or Need) to Know...and More! National Fatherhood Initiative® (NFI) offers over 100 fatherhood skill-building resources and programs, which everyone thinks is great! But sometimes, all of those choices can be overwhelming, and it can be hard to find time to learn about how each resource can help your organization better engage fathers. With this in mind, we're offering this free webinar to help you learn what the best fit is for you and your organization. Who > Join NFI President Christopher Brown where he will highlight all you want or need to know (and more!) about NFI's extensive catalog. What > Free Webinar titled NFI Programs: All You Want (or Need) to Know...and More! Father engagement and facilitator training, and more. Click here to register for this free webinar and please share this opportunity with other fatherhood and family leaders.